Beat together the egg, milk and saffron. Tip into a large, shallow dish and add the bread. Leave for a couple of minutes then turn and leave until the bread has absorbed all of the mixture. 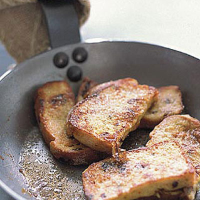 Heat the butter and oil in a non-stick griddle or frying pan. Cook the bread over a medium heat for 3-4 minutes on each side, until puffed and golden brown. Sprinkle with the cinnamon sugar and serve immediately. Panettone left over from Christmas makes a lovely substitute for the fruit bread used in this recipe.